Keep your spinning wheel well maintained and it will last a lifetime! 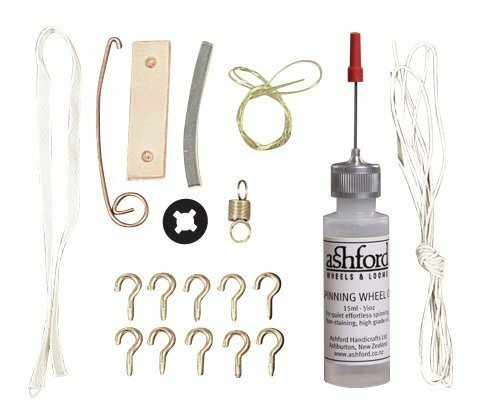 The kit includes 15ml (½ fl ozs) special lubricating oil (non-staining), threading hook, tension spring, flyer hooks, leather conrod connector and clip, brake band and cotton drive band. The kit includes 15ml (½ fl ozs) special lubricating oil (non-staining), threading hook, tension spring, flyer hooks, leather conrod connector and clip, brake band and cotton drive band.. If you have any questions about this product by Ashford, contact us by completing and submitting the form below. If you are looking for a specif part number, please include it with your message.